Tatra mountains are the highest and most beautiful Polish mountain range. They're located in the south of Poland - we're lucky to have such amazing mountains at hand! The majority of Tatra mountains (including the highest peak Gerlach - 2654 metres) belong to Slovakia, but Poles have a lot of interesting hiking trails too 😉. The highest mountain in Poland is Rysy. It all makes hiking in Tatra mountains a pleasurable experience. During our recent backpacking trip in Tatra National Park we slept in 2 mountain huts: Hala Ornak and Polana Chochołowska. What's worth mentioning is that the standard of Tatra mountain hostels is better than in other Polish mountain ranges (but they're also more expensive). In comparison with Sudety or Beskidy (e.x. mountain hut on Wielka Racza), Tatra hostels offer very good standard. I need to point out here that I'm not a person who would happily sleep in a tent for a week. Nor am I inclined to sleep on the floor with no access to shower. The reason is quite simple: I spend my trips and holidays actively, so I need to get a good rest at night. Otherwise, I'd simply not enjoy my travels (and not be much fun to people who travel with me - I tend to get grumpy when I don't get enough sleep). I need some comfort and I like sleeping in bed. Silence and darkness are my best companions at night. So, I may be fussy when it comes to sleeping somewhere for more than 1 night in a row. Fortunately, I got far more sleep in these mountain huts than I'd expected. So, let's have a look at mountain hostels in Polish Tatra mountains. Please note there are 2 mountain lodges missing: Kalatówki Mountain Hotel and Roztoka Valley. We've never been there, but I'll update this article once we visit those two places 🙂. The hostel is located on 1108 metres. It may not be very high, but it's great spot - hala Ornak is perfect starting point for hikes in Western Tatras. There are several hiking trails leading to the hostel, including Koscieliska Valley (green trail) which is considered the most beautiful valley in Tatra National Park. The trail is wide and easy, perfectly safe even for families with baby carriage. Hala Ornak lodge is rather small - its accommodation capacity is 49 beds. I booked 2 beds in 3-person room a week in advance (it was May). I strongly advise to book your beds/room as soon as possible - Tatra mountains are very popular among hikers, especially in warm months. Anyway, there were only two of us in the room, so no snorting or sleep-talk disturbed our night. The quiet hours are 10PM - 6AM. There were some brisk people who thought it's cool to listen to music after 10 PM, but I was so tired that I ignored the noise and fell asleep instantly. The bedding is included in the accommodation fee however, if you're chilly person, you might want to take your own sleeping bag as the "duvet" available in Polish mountain huts are basically blankets in cover. Temperature at night drops significantly even in the summer, so it's good to have some fleece jumper at hand. The sanitary facilities were OK - the bathroom was clean and spacious, but there's only one shower available for women. There's also drying room available. The Internet wasn't great but I didn't mind - I don't go to the mountains to surf the web 😉. Ornak mountain hut isn't connected to power grid - at nights the electricity comes from power generator. The hut serves delicious food - potato pancakes and scrambled eggs were mouth-watering and definitely worth their price. I liked the fact that there's a lot of outdoor tables and benches near Ornak lodge where you can enjoy your food listening to forest sounds and admiring breathtaking view of Tatra mountains. Priceless experience. This mountain lodge is located on 1146 metres at the end of Chochołowska valley. The trail leading along this beautiful valley is great for families with children and bikers - wide path and mild ascent make it perfectly safe to lively youngsters. However, fantastic landscapes and easy path attract loads of tourists, so it's best to hike this valley on weekdays. This mountain hut is definitely more like a hotel. In fact, it's the biggest mountain hostel in Tatra National Park - its accommodation capacity is 121 guests. The good thing about it is that we managed to get 2-person bedroom. When I booked the beds one week in advance, I was informed that only 6-person room was available, but when we got there it turned out they had some spare doubles. The showers are conveniently located on the same floor as rooms. Our room had wash basin which was very nice surprise. The fact that the mountain lodge is located in the most popular and easily accessible valley makes it immensely popular among tourists (and less among hikers). Despite the fact we stayed in comfortable 2-person room, I didn't get so much sleep as I expected - the corridor was filled with excited cries coming from drunken tourists watching TV in guest room. All these facts make booking a room in Morskie Oko hut very difficult. Also, the owners won't allow you to sleep on the floor, because it's so easy to get back to Zakopane. Solution: book a room a year in advance. In Morskie Oko mountain hut there's a restaurant open 7AM - 9 PM in high season. It's not possible to pay but card, but there's ATM available. In the mountain shelter there's also winter gear rental place. Murowaniec shelter is located on 1500 metres in Gąsienicowa Valley. It offers 116 beds in total, there are also double rooms available. I like this hostel - it's big and spacious, there's never been an issue with warm water and the food is delicious! There's even a fast Wi-Fi available, which might be a great advantage. Murowaniec hut is the only hostel in Tatra mountains which accepts payment by card. What's important to remember is that in Murowaniec it's not possible to spend night on the floor. But there are many other great things which this hostel offers: drying room, board games, possibility to rent a guitar, luggage storage, sports gear service place, weather forecast. There aren't many High Tatra mountain huts. Five Lakes Valley is the only mountain hut in High Tatras in Poland. 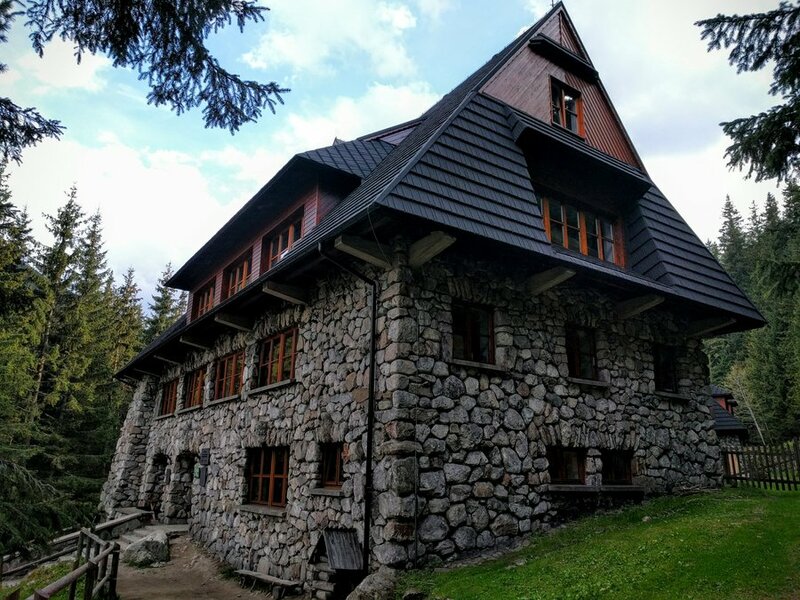 Mountain shelter in Five Lakes Valley is the highest located hostel in Polish Tatra mountains (1670 metres). It's loved by many, as it's situated in the most beautiful Tatra valley. Its accommodation capacity is 67 beds. Because of its popularity, it's not easy to get a bed there if you didn't book it a few months in advance. What I like about Five Lakes Valley mountain hut is its high mountain atmosphere. It's located deep in High Tatras and all the trails leading to it have to be hiked, there are no lifts or horse carriages available. Tourist kitchen is well-equipped. Weather forecast and avalanche risks are available all the time. Interestingly, Five Lakes Valley shelter offers also guiding services as 5 plus Mountain Academy. This mountain school organizes hiking and climbing trips in Tatra mountains. The team includes the best Tatra mountain guides, Polish Alpine Association instructors, International IFMGA guides, and rescuers of the Tatra Mountain Rescue Service. All of them are certified. You can learn more about this school here. Mountain lodge in Kondratowa Valley is located on 1333 metres in picturesque Western Tatra mountains. It's the smallest mountain shelter in Polish Tatras - there are only 20 beds in 3 shared rooms. It's very easy to hike to this mountain hut - trail head is in Zakopane Kuźnice and it takes only 1 hour to get to Kondratowa Valley hostel. The biggest advantage of this mountain lodge is its location - it's situated close to famous Red Peaks trail and Giewont mountain. Facilities in Kondratowa Valley hostel are rather basic. It's fine to spend there one night and move on. Bathroom with shower is open from 7PM until 10AM next day (there's one shower). Boiling water is free of charge and is available all the time. Accommodation price includes a pillow and 2 blankets, so it's necessary to take your own sleeping bag. If you booked a room, the mountain hostel wants you to arrive until 4PM, which is quite early. It's important to note that accommodation is available from December 26th until November 15th. From November 15th until December 26th rooms are unavailable for tourists because of maintenance work. In that time only the restaurant is open. → Tatra National Park is extremely popular among hikers and tourists, especially from June till September. → Not all mountain refuges will take you if there are no beds available. It's always good to book your bed/room in advance. If you don't have this option, at least check if they allow sleeping on the floor. → In high season in the most popular mountain huts there may not even be enough space to sleep on the floor. → Some of Tatra hostels offer the possibility to rent winter gear. → Mountain lodges in Poland are open all year round. → They will feed you alright. → There are no waiters. Unlike in Western European shelters, we can bring our own food to the restaurant. → Kitchen and reception are usually open from 8AM until 9PM, but the opening hours may vary according to season. → There's no possibility to pay by card - cash only (exception: Murowaniec hostel). → Mountain hostels provide bedding, but charge additionally for it. Tourists can sleep in their own sleeping bags. → Boiling water is free of charge. I personally liked Ornak hut the most. It may not have been freshly refurbished and is rather small. But I like that - it's not that popular so the atmosphere in Hala Ornak hostel is hiker-friendly. There were no screaming children or drunk middle-aged tourists who thought it would be great to spend whole weekend in mountain hut just sitting around and sipping beer. All in all, I liked the experience immensely and will definitely do this again, most probably in Slovak Tatra mountains (I love Polish mountain range, but Slovak Tatras are less crowded). It's great feeling to wake up in the morning and see mountain forest and hear birds chirping merrily. And the fresh, sharp air fills with energy and excitement to start new hiking adventure. There's also great atmosphere in Tatra mountain huts - staff and fellow hikers are friendly and you get to meet really interesting people there. And you don't need to wake up at 4 AM to hike your planned route - you have hiking trails a few metres from your bed 😉. What to do if there's no room in a mountain shelter? If the mountain huts in Tatras are already fully booked and they aren't likely to allow you sleep on the floor, then you might want to find place to stay in Zakopane or nearby villages. It's forbidden to camp in Tatra National Park. If you'd like to stay close to Zakopane center, there's a budget-friendly option right on Krupowki street - Top Hostel. Nice and clean, with double rooms available. Breakfast is included. If you prefer to stay somewhere quiet and close to trail heads, then you might want to choose nearby villages: Murzasichle or Bukowina Tatrzańska. Both are located close to Zakopane, but the prices are lower and they are less crowded.